IWRI was honored to host our whanau (family) from Aotearoa (New Zealand) twice this past year. In May of 2017, ten members of the Te Kotahi Research Institute (at the University of Waikato), Te Māngai Paho (Wellington, NZ) and the University of Auckland, along with a regional director of the Kamehameha Schools in Hawaii, visited the University of Washington and the Pacific Northwest Native American community. 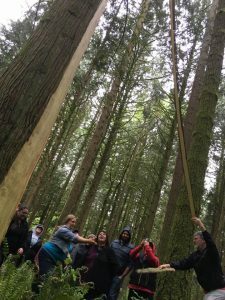 The week started with a traditional cedar bark harvesting activity with the Snoqualmie, Snohomish and Stillaguamish Tribes. 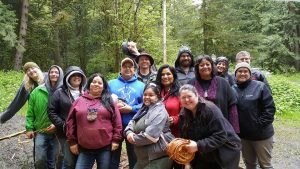 Despite the heavy rain, it was a perfect way to spend Mother’s Day honoring grandmother cedar, mother earth, sharing stories, songs, and food while working hard to pull and process cedar bark, which was then given to tribal elders. The busy week included discussions of the Honour Project Aotearoa which aims to understand the health and wellbeing of the Maori community by investigating access, provision and appropriateness of health care services; discussions of the He Oranga Ngakau Project, a research project which explores trauma informed care practices from a Maori perspective; as well as the Native Organization of Indigenous Scholars Conference, where Dr. Linda Tuhiwai Smith presented the keynote address, and Dr. Leonie Pihama, Dr. Matthew Roskruge and Ms. Alison Green offered a panel presentation. 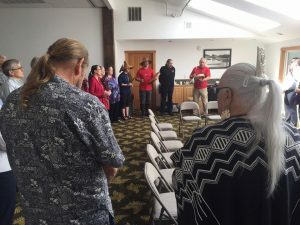 In-between sessions, different members of the group were able to visit the Chief Seattle Club and meet with director Colleen Echohawk and staff. Other group members lunched with a delegation of women from the Tulalip Tribes. A dynamic discussion at the luncheon led to an interview of two Maori guests on slexil, the Tulalip Today TV show. The very busy week wrapped up with a visit to the Samish Indian Nation where our visitors shared songs, stories, a wonderful lunch, and experienced some time on the water in the canoe. The day concluded with a delicious dinner at the Swinomish casino resort. In September of 2017, IWRI hosted Dr. Cherryl Smith and Dr. Rawiri Tinirau from the Te Atawhai Maori Research Institute, Whanganui, New Zealand. The group visited the Billy Frank Nisqually Wildlife Preserve and stopped in at the Chief Leschi Schools Puyallup Tribe Annual Pow Wow. They also visited with Seattle-area Choctaws for a barbeque at Daybreak Star Cultural Center. We are always blessed to have our whanau visit and are happy when we are able to connect them with so many members of our extended community. Thank you to everyone who was so generous and welcoming to our Maori guests. Our PNW Native community is amazing. Thank you to our whanau from Aotearoa for sharing your scholarship, for our ongoing research partnerships and for enriching our entire community with your insight and powerful presence. We look forward to the next visit!